For Majoring in Film and Sample courses descriptions -> please click HERE. Film schools provide learning in the field of film theory, film analysis, and filmmaking, training the next generation of filmmakers, critics, experts, and professors. And while having a degree from one of these universities is helpful, the reality is that the vast majority of graduates will start out in the field like everyone else, as a production assistant (PA). This is a performance based industry and no one really cares where you got your schooling, but they do care about your work. So it is highly unlikely that the day after you graduate, you'll step onto a major feature film as a director or cinematographer. If you are someone who needs that external pressure of deadlines, and school assignments in order to help you grow, then maybe film school is the right choice for you. Many community colleges are offering film programs of their own these days. And while they are not as prestigious as AFI, or USC, they may allow you to actually afford to work in the industry after your graduate. With regard to this, Litz USA has a wealth of Community Colleges that would suit your purposes. Before you choose your film school, you need to determine your preferred field of study first, and then, plan for your academic career. You also need to consider the right location, with the right class size, that is going to fit your own personal academic plans. It is also important to check on the film school requirements, common cinema program tuition and the difficulty level of this course of study before applying to any programs. 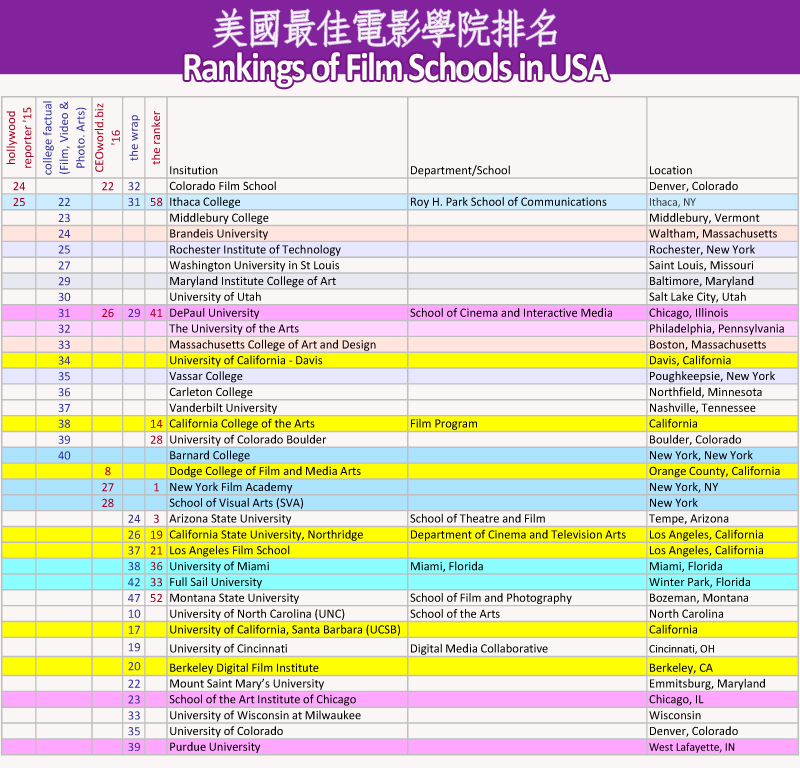 We have compiled a few rankings for film schools in USA, we hope the list would help you in search of the right school. 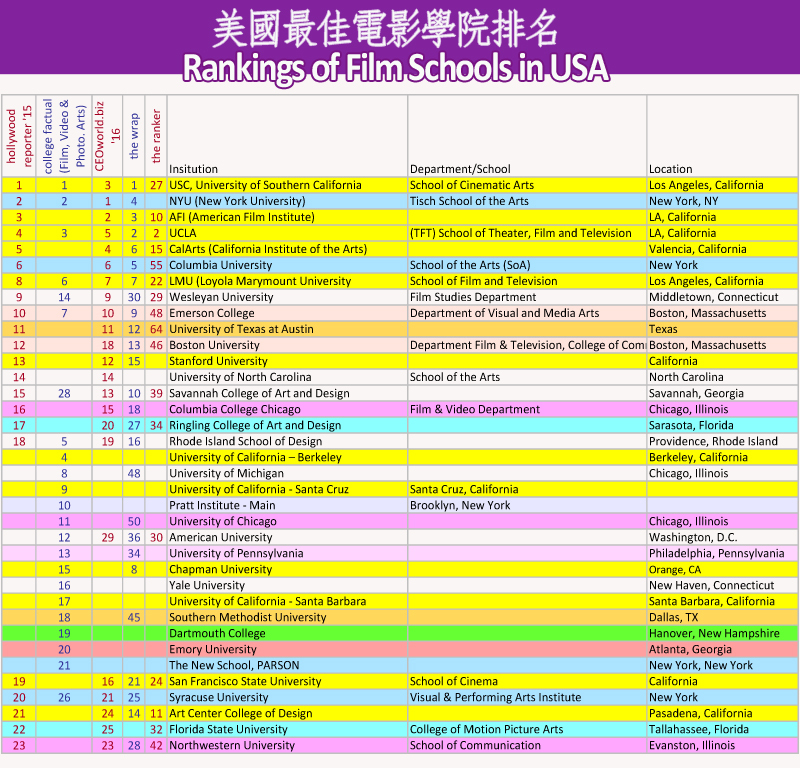 At the end of the chart are descriptions of some of the renowned film schools in USA. It is important to be aware that while some film programs are more academic and theoretical, others are more practical, providing students with more hands on experience. Litz USA would also recommend the Academy of Creative Media (ACM) under the University of Hawaii (UH) system. Since 2004, ACM Mānoa has empowered students to tell their own stories by teaching cinematic narrative theories, skills and application across multiple platforms of digital media. As one of the premier film schools in the Pacific region, ACM helps students shoot films all over the Asia-Pacific and US, and participates in annual exchanges with China. ACM’s faculty is comprised of award-winning filmmakers and scholars from diverse professional and cultural backgrounds. ACM students work on TV shows like LOST and Hawaii 5-0, feature films like The Descendants, and go on to graduate film programs at top schools like USC, NYU, AFI, CalArts, and Chapman. While it is not easy to get straight into Manoa, the flagship of UH, students from Hong Kong can first start off in UH’s KCC or UH West O‘ahu campuses.